If you red my last posts, you have noticed that one part is missing. That is: “What does it has to do with effort, and non-effort driven tasks”. Well it does, when you add additional resources to those tasks. 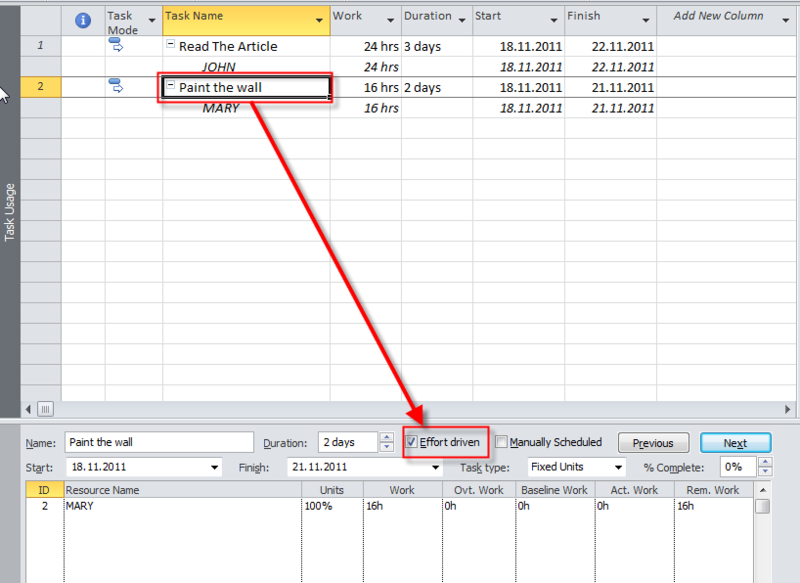 I have two Tasks in my example: Read The Article, which is non-effort driven task, and Paint the wall, which is effort driven task. 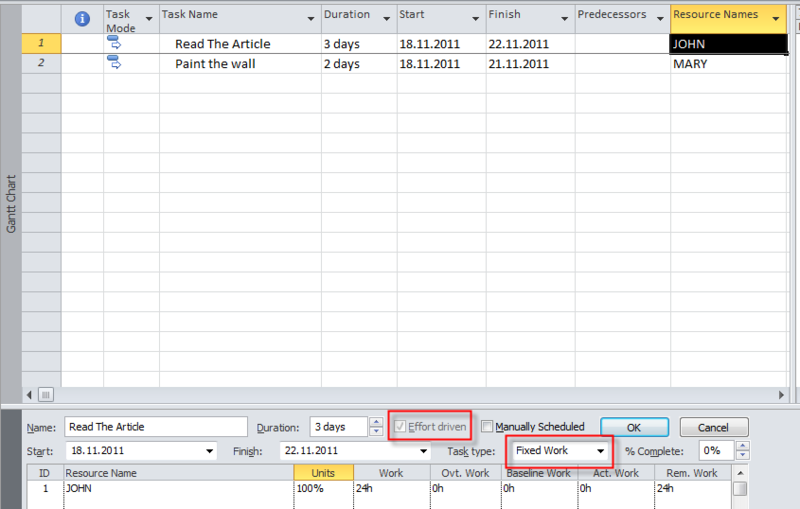 Notice that both task are Fixed Units. Because this is Non effort driven task, John and Mary must work 3 days, and that means 8 hour per day, which is 24 hours. 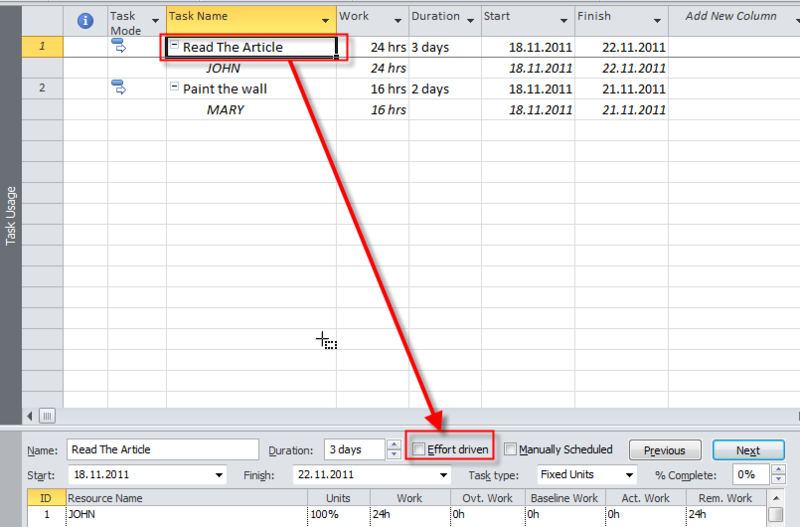 So the total work for this task will take 48 hours (24 from Mary, and 24 from John). So, when you have a Fixed units, non effort driven Task, and you assign new resource to the task, Work is changed, and Duration and Units are unchanged. Because this task is effort driven, and the Task type is Fixed units, both Duration and work are changed, and Units are unchanged. That means, that when I assign additional resource (John) to the Task, both John and Mary will have to work less hours in total, and Duration will be shorter. 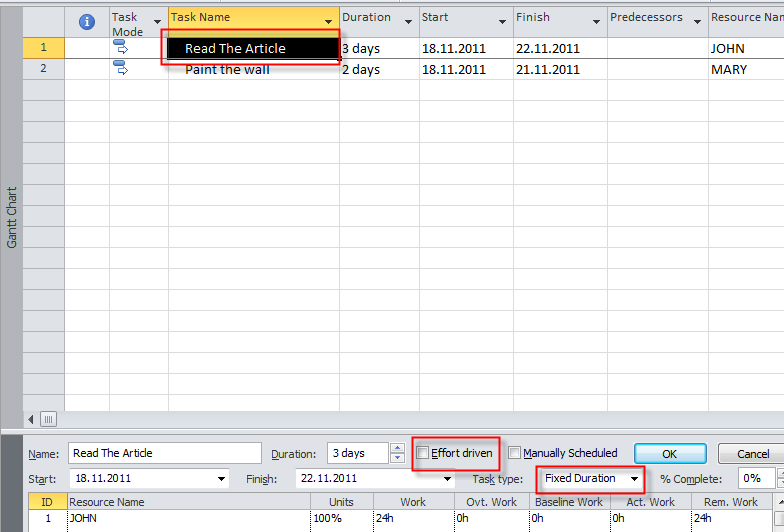 Because this task is effort driven, and the Task type is Fixed work, Duration is changed, and Units are unchanged. Why? Work is fixed, and it means that we have to spend 24 hours for it. When I assign Mary to the Task, it means that Both, Mary and John have to work 12 hours in total, to fulfill those 24 hours. And because Units are unchanged, it means that they can work max 8 hours per day. So, they will work 8 hours at first day, and 4 hours at second day to achieve 12 hours. The Magic Formula is: Work = Duration * Units, so it means, 12 = Duration (8 hours per day) * 100 = 12/8 = 1,5 day per each person (John and Mary). That means, that when I assign additional resource (Mary) to the Task, both John and Mary will have to work less hours in total, and Duration will be shorter. Now I will undo those changes to get the initial setup, with one resource per task, but I will change both tasks to the Fixed Duration type. Because this is Non effort driven task, John and Mary must work 3 days, and that means 8 hour per day, which is 24 hours. So the total work for this task will take 48 hours (24 from Mary, and 24 from John). So, when you have a Fixed duration, non effort driven Task, and you assign new resource to the task, Work is changed, and Duration and Units are unchanged. Because this task is effort driven, and the Task type is Fixed duration, Work is changed, and Units, and Duration are unchanged. That means, that when I assign additional resource (John) to the Task, both John and Mary will have to work less hours per day , and Duration will be the same. In my next post I will explain the costs! This entry was posted in MICROSOFT PROJECT, Microsoft PRoject 2010, MS PROJECT 2010, PMI, PRoject Management and tagged Microsoft Project 2010, MS PROJECT, ms project - scheduling, MS PROJECT - Task types, Project Management. Bookmark the permalink.